A Matter of Memories: SSFS #25 - Business Cards for Scrapbooking Inspiration? 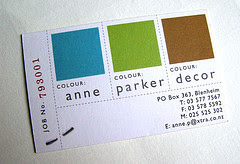 SSFS #25 - Business Cards for Scrapbooking Inspiration? Sure, why not? 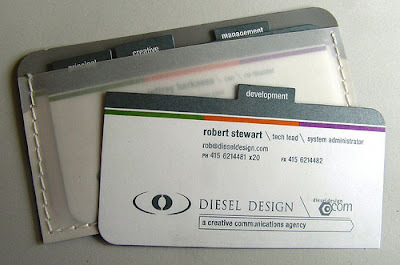 Anything can be inspiring, especially this great set of business cards featured on Flickr by Daily Poetics including 541 'cards' for inspiration! Card/Challenge #1 - The design of this card could easily be transformed into a layout. The color combination is also modern and inspiring. 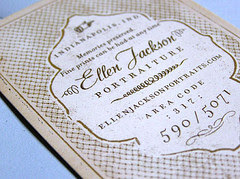 Card/Challenge #2 - How about this...a unique rope treatment to embellish the outer edges of a 'rustic' layout. The center element could be your photo & title which could flip up to reveal your journaling. Card/Challenge #3 - This is a great idea for a page element...a pocket to hold numerous tabbed journaling cards and/or photos. Card/Challenge #4 - A great reminder that not all great design is square. 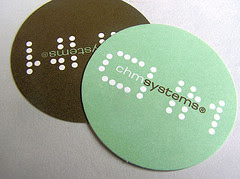 Create some circle embellishments or, what the heck, create your entire layout in the shape of a circle. Card/Challenge #5 - Not only are these cards extremely inspiring in shape, color and texture, but also in typography. Take a cue from this card when creating your next journaling block. 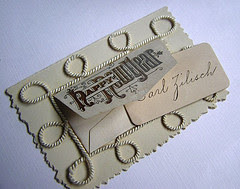 Card/Challenge #6 - Not all business cards are created the same...and neither do scrapbook layouts. How about using corrugated cardboard as the base for your next layout? Which card/challenge is your favorite? Let us know...if you take one of the above challenges on your next layout, be sure to share it with us here by leaving a link for us in comments. Are there other cards from the Flickr set that especially inspired you? If so, leave a link to the card and tell us why?